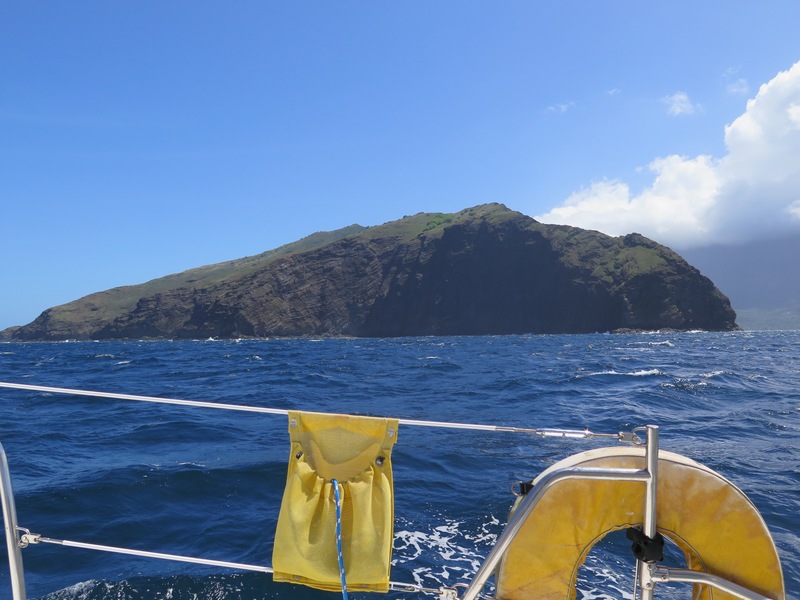 The sea was rough leaving Hiva Oa for Tahuata, and as we motored the few miles between the islands we rode a strong current that pushed us fast along the channel. 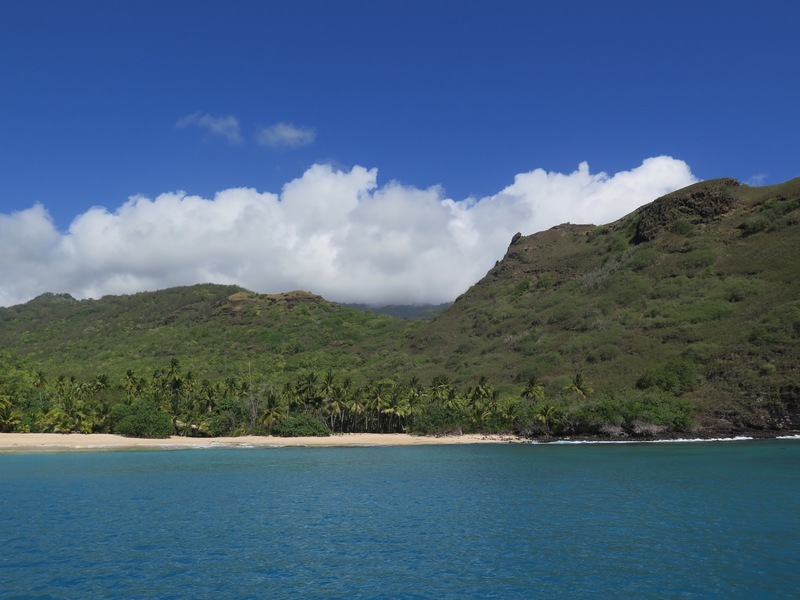 When we reached the northwest corner of the Tahuata we turned south and soon saw the rock promontory that marked the entrance to Hanamoenoa Bay, said to be one of the best anchorages in the Marquesas. We watched the mast of a boat that left Atuona shortly before us as it entered the bay, and the closer we got the more masts we saw. “Holy cow,” I said, “I hope there’s room for us!” After the rolly crowded harbor at Atuona we were looking forward to a clean, safe and comfortable place to spend a week or so and get the boat sorted out and back to normal. There was plenty of room as it turned out. We dropped the anchor, then thought better of the spot, raised it again, dropped it again. We were in the back of the pack, far out toward the ocean with a lot of chain out in the 50′ depth. We consulted the chart and decided to motor all the way in toward the beach. 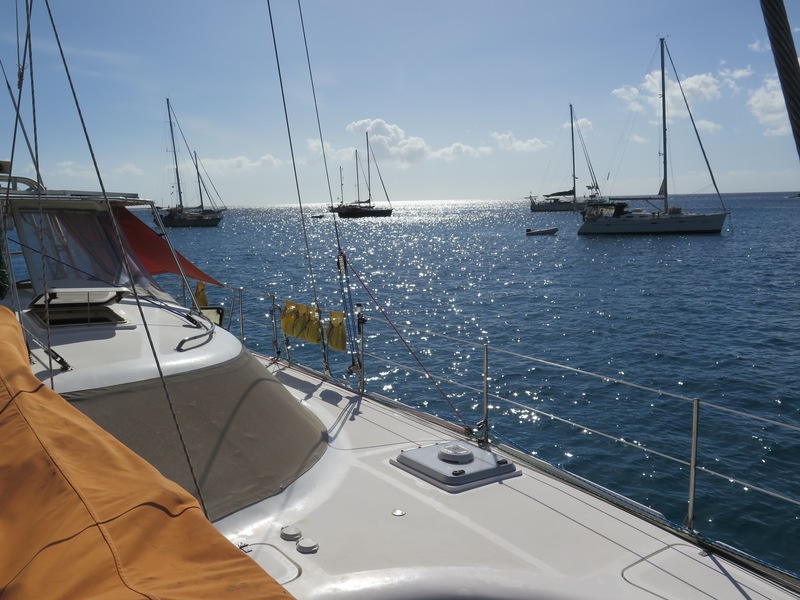 As a catamaran with a shallow draft we can usually go into shallower water than deep monohulls. We raised the anchor again and motored in, watching the depth sounder and monitoring the gusts that came whooshing down off the surrounding hills. We crept closer and closer to the beach and dropped the anchor in 18′, much preferred to the outer anchorage not only because we have to put out and retrieve less chain, but also because we have an unencumbered view of the white sandy beach and the coconut palms. As we tidied up after anchoring, two other boats from the back up-anchored and moved up to the beach as well, then a single-hander who’d been anchored near us in Atuona arrived and dropped his hook beside us. 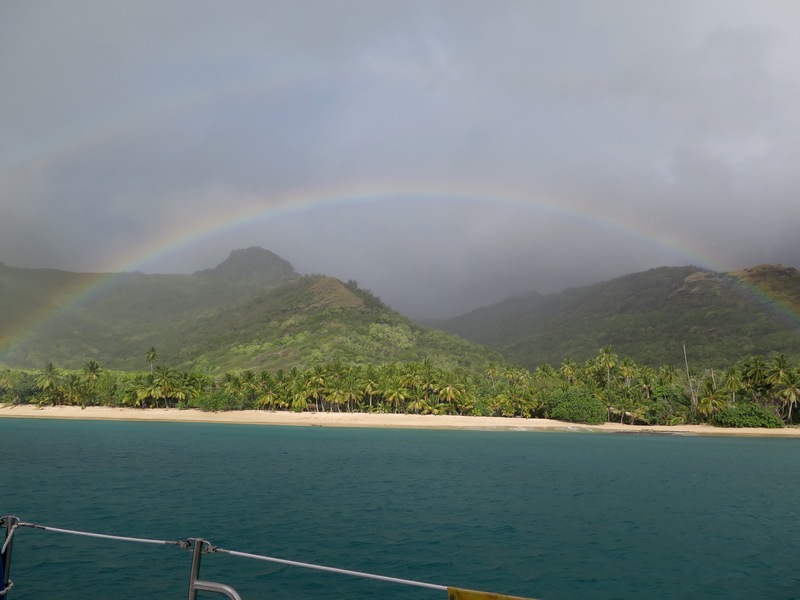 By the end of the day there were 19 boats in the anchorage, about the same average number as there’d been in Hiva Oa but in a much larger space, with excellent sand holding and plenty of swinging room. The water is clear blue, perfect for running our watermaker, and while it’s certainly gusty, we’re protected on three sides from the ocean swell. Escape Velocity bobs gently at anchor and I think she’s grateful for the peace and quiet, just like we are. For the first few days there were many comings and goings. A couple of kid boats shuttled their broods back and forth to the beach in their dinghies. Boats arrived, boats left. Some left in the late afternoon for the overnight passage to Nuku Hiva; others went back to Hiva Oa to get fuel or other supplies. By Tuesday afternoon there were only two of us left in the anchorage. It’s a lovely bay, but not distinctive like the Bay of Virgins in Fatu Hiva. We’ve been in more remote and exotic places in our travels and we both agree we have to remind ourselves where we are. It serves our purpose, though. We spend our days doing minor boat chores, cleaning, inventorying and reorganizing our provisions. Some days we don’t do anything but read and listen to the surf crashing against the lava cliffs a hundred yards away. We spent a long time preparing for the Pacific passage and now that we’re here it’s taking some time to switch gears. We were 42 days at sea, but many months before that planning, getting the boat ready, provisioning, researching weather and currents and routes — not that much of that helped us, as it turned out — and all the mental preparation an ocean sailor does to gear up for a long passage. It was easily nearly half a year, and half the year before that was concerned with rerigging, so that for almost the whole year we weren’t actually cruising. Now finally we are again, and we want to relax and enjoy the life. I have time to cook more elaborate meals, time for spring cleaning, for beading, for snorkling, for exploring the world around us. We’re not in a hurry to leave here. We may move to the bay just below us because there’s a store there and maybe we can get some fresh vegetables and Internet. Other than that, we’re content to stay and enjoy this nearly deserted anchorage for a while. The supply ship is in Atuona today so I expect there will be a new influx of boats as they take on supplies and move on. That’s ok. We’ll watch them come and go.